Ooh, how fun! I get to be the guest author this week. I’ll just make myself cozy here. Why, yes, those cookies look lovely. I’ll have twelve. How could I say no to a cup of tea? Sure, go ahead and splash a dash of bourbon in there. Now, let’s settle in for a nice chat. For each of our launch weeks, we will be interviewed by our fellow Debs. I’m up first! This week has been an amazing whirlwind. I was told to expect quiet and maybe a feeling of “that’s it?” on launch day, but I have felt nothing of the sort. I was overwhelmed by the support I got from so many of you! On Monday, people emailed and texted me their shipping notices that MODERN GIRLS was on its way. On Tuesday, my social media exploded in the very best way possible with photos and kind words. My husband read my interview in Huffington Post and went out and splurged on good bourbon for me. I received flowers and brownies from friends. 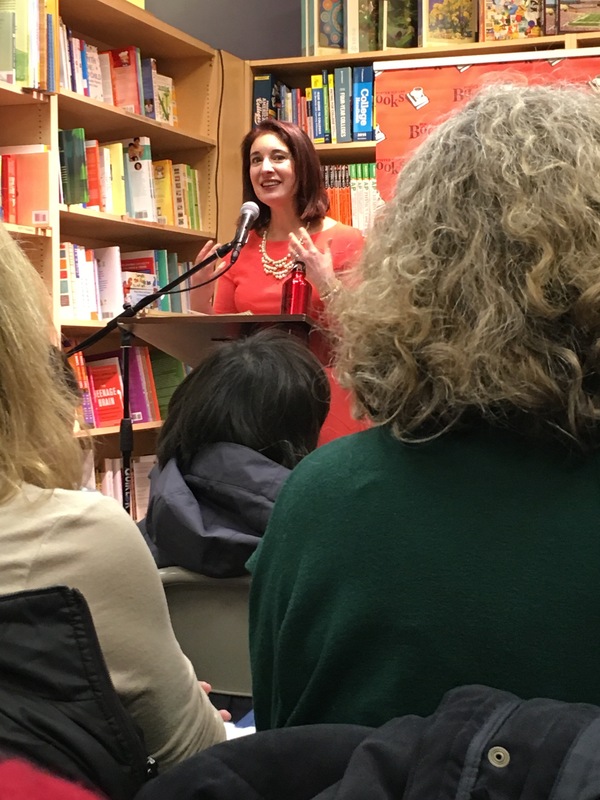 And then my launch reading the next night, at Porter Square Books, was everything I could have hoped. The room was filled with friends old and new. I didn’t accidentally drop any f-bombs. The bookstore sold out of my books. The after-reading drinks and snacks was a raging success. I was on cloud nine and I didn’t want the evening to end. So now that MODERN GIRLS is out in the world, I’m fielding questions from the Debs. Plus, I have a giveaway of signed copy of MODERN GIRLS (details below). Here we go! Louise asks: I feel totally absorbed in the time period of your book, but the period details are seamlessly worked in. Could you talk about how you chose the details, and how you did it without your research showing? Finding that balance of having the right details for the time period to come alive for the reader, yet not having so many that the reader feels like the author is showing off her knowledge is challenging. In the first draft of the novel, I had way too many details: the names of some of the sketches (Linda preferred “Man, Wife, and Lover”; Edith liked “The Forsaken”), which theater (Public Theater, Second Avenue and Fourth Street), and who the actor was (Michael Razumni). All interesting facts for me to research, but they added nothing to the story. I have folders filled with fascinating (to me) morsels that I didn’t use. But in many ways, it’s cool for me, because it’s like I know secrets about the characters, such as their favorite actresses or what historical figures my characters were named for. Heather’s question is: One of the themes of your book is the upward mobility of women from generation to generation over the past century. Can you describe how that’s reflected in your own family, from the generation that parallels Dottie’s grandmother in the Old Country to your own, and how that influenced the writing of MODERN GIRLS? All of my great-grandmothers (none of whom I met) were born in Eastern Europe: Latvia, Ukraine, and Lithuania, though those countries were simply called “Russia” back then. Two of them ended up in the South, one in New Jersey, and one in New York. All had to learn English, and three of them didn’t observe the Sabbath in America. (The one in the most remote location–Chipley, Florida–not only remained observant, but her husband had to drive to Dothan, Alabama, to buy her kosher meat.) Both my grandmothers were both born in America. I remember my maternal grandmother telling me about her mother, how my grandmother wanted her to dress in newer clothes and how strong her accent was. My grandmother was definitely an American, and from the stories she told, her mother was Old Country. Yet as much as a spitfire as my grandmother was, she was downright old fashioned compared to my own mom. My parents married young–my mom was just 18–so she didn’t go to college until she had two kids, so I have clear memories of her as a student. While at the time I bemoaned that I didn’t have a “normal” mom, one who studied law or medicine, now it seems kind of cool that she became an artist and took welding classes and learned to cast bronze sculptures. To this day, my mother can out curse anyone… with the possible exception of my own daughter. Seeing how this played out in my family definitely influenced how I shaped the story. I kept pictures of my great-grandmothers as well as my grandmothers around me as I wrote, to use as inspiration. Many of the tidbits in the novel came from stories I’d heard about their lives: my great-grandmother was knocked down by a horse at a protest in Ukraine, a different great-grandmother lied about her age, my grandmother ran track. This novel was heavily influenced by my own foremothers. Aya asks: In today’s polarized political landscape around women’s reproductive health, have you been at all anxious writing about unplanned pregnancies? While I was writing, this never crossed my mind. Of course, why would it? I had no idea anyone outside my writer’s group would ever read the novel. But once the book went out into the world for advance readers, I feared what might be said. My book is about unwanted pregnancy. All the options are explored. People (including me!) have very strong views about what women can and should have as options. I know some readers may be unhappy with portions of this book. I will say, though, that I have had some truly wonderful reviews from people who have stated straight out that their beliefs are different from mine. I read those reviews with an open mind and am extremely grateful that they were still able to engage with the characters and come away with positive feelings about Dottie and Rose and the book in general. And finally, Abby wants to know: So what about a sequel? This has been such an amazing week. I’m so sorry my launch is coming to an end, although I am looking forward to continuing my journey as a writer. And if you have any questions for me, just ask in the comments, and I’d be happy to answer them. In the meantime, you can find me on Goodreads, Facebook, Twitter, Instagram, and my website. MODERN GIRLS can be purchased online at a number of retailers and at your local independent bookstore or Barnes & Noble. And I’m giving away a signed copy of MODERN GIRLS, so please enter our giveaway! Thank you so much for being apart of the launch of MODERN GIRLS! GIVEAWAY: RETWEET on Twitter, and/or SHARE on Facebook by Noon (EST) Friday, April 15th to win a signed copy of MODERN GIRLS (US only). We’ll select and contact the winner on Friday. Good luck! Jennifer, I haven’t even read Modern Girls yet but am also hoping you write a sequel. The cover has me captivated reminding me of when I worked in NYC in the 60’s and still word gloves and heels. 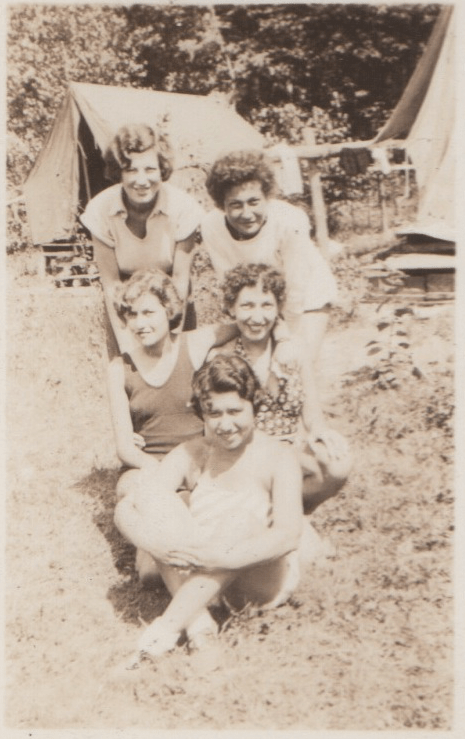 Love the photo of all the Moms….one even looked like mine. Best to you and Congratulations! I’ve wanted to read Modern Girls since I saw the book in a poll on Goodreads months ago. Congrats Jennifer. Thanks, Suzy! I hope you enjoy it!